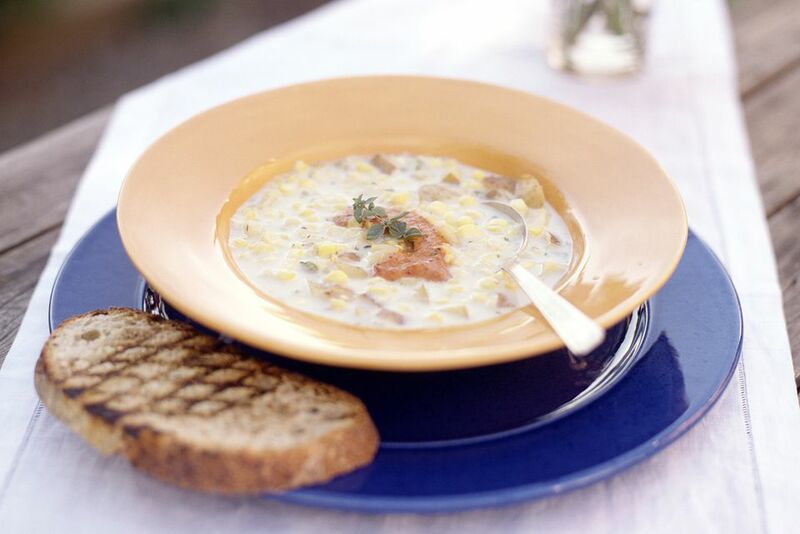 This corn chowder with bacon is an excellent choice if you're looking for a hearty, flavorful chowder. Plenty of cooked bacon makes it a good lunch or dinner soup. Add biscuits or crackers and a tossed salad for a full, satisfying meal. The chowder is delicious as it is, but it is also versatile and can be changed to suit your taste. Add a few chopped green onions or 2 tablespoons of minced fresh parsley for additional color. Or reduce the bacon and add some cooked diced ham or chicken to the chowder before it's finished cooking. Or turn it into a clam and corn chowder! See the tips and variations for more ideas and additions. In a large saucepan or Dutch oven over medium heat, fry the bacon until browned and crisp. Add the chopped potatoes and onions and continue cooking, stirring, until the chopped onion is translucent. Add the water, cream-style corn, and seasonings; bring to a simmer. Cover, reduce the heat to low and continue cooking at a simmer for 15 to 20 minutes. Stir in half-and-half and heat through but do not boil. If you have leftover chowder, transfer it to containers and store it in the refrigerator for up to 3 days, or freeze it for up to 6 months. Once the bacon is crisp, remove about half of it with a slotted spoon and use it to garnish servings of the finished chowder. Reduce the cream-style corn to 1 1/2 cups and add two 5- or 6-ounce cans of minced clams along with the potatoes. Replace the 2 cups water with clam juice. Add 1/2 cup of shredded or diced carrot and 1/2 cup of diced celery to the bacon drippings along with the potato and onion. Add 1/4 cup of finely diced sweet red bell pepper along with the potato and onion. Garnish servings with a few tablespoons of shredded cheddar cheese or a sprinkling or grated or shredded Parmesan cheese. Replace the half-and-half with 1 cup of whole milk and 1 cup of heavy cream. Replace the water with chicken broth or vegetable broth.